Finish off your signature burger or fried fish sandwich with this Choice 16 oz. clear wide mouth squeeze bottle. This bottle's versatile, simple design is ideal for both back-of-house and front-of-house applications. While its open tip eliminates the need to cut off the top, its tight, no-leak cap prevents accidental spills and messes. Thanks to its innovative, wide mouth design, it's also easy to refill and clean after busy shifts at your restaurant, cafe, concession stand, or cafeteria. These wide mouthed bottles work well. They are, for the most part, durable and versatile. We use it for condiments for the tables and plate presentation in the kitchen. We toss our housemade sauces in these bad boys and squeeze away. If the tip isn't wide enough, snip a little off and you're off to the races. A quality squeeze bottle for all purposes. Fill it with any condiment or sauce to make food prep even easier. We use them for quick condiment applications and flavored syrups for craft coffee drinks. No complaints, easy to clean and fill. These squeeze bottles are a great addition to our drop off catering jobs! They are reasonable in price so we can fill with our sauces and leave for the customer. Good quality product. Obviously the price is great and this is an absolutely necessary product, but hey seem to leak unless you really twist hard. They also seem to loosen occasionally. I’d like to see a better seal between the lid and bottle, but it’s not a huge deal. These bottles have held up well in the dishwasher. The wide mouth makes them easy to clean and fill. The nozzle at top has to be trimmed if sauce is heavy. These squirt bottles are a perfect item for our business because we handmake several dressings. It's an excellent choice to be able to have efficient distribution of dressings. These are excellent for all of our sauces. We use them for about 15 different sauces and they work fantastic. We would definitely order these again. These squeeze bottles work great for our barbecue sauces at the table. Being a barbecue restaurant that has 4 homemade sauces at the table, we needed a lot of bottles and the savings are incredible. We did have to cut the tips of some of them to allow thicker sauces with crushed red peppers to come out. I use these so much I bought a 6 pack. I use them for designing soap in multiple colors. Very easy to control the pressure to squeeze or add much or as little as you need. The wide mouth makes clean up a breeze! I used to use squeeze bottles that didn't have a wide mouth, they were difficult to clean up and not as sturdy. Very useful product for our coffee and sandwich shop! We use these for drizzle on our cold coffee drinks, and for lots of ingredients in the kitchen making sanwiches. Great price for good quality bottles! Nozzles easily trim to increase flow amount too. I bought it for my ice cream shop, bottle works great, the bottle has good quality. I highly recommend for other people to buy it. this is good quality bottle. I use for every sauce. it is good price too. perfect for every sauce and dressing. i really like it. Lowest prices for a six pack ofsquueeze bottles. Sams Club has them for around $1 more so I only bought these while I ordered other items and it didnt effect the shipping cost. Great Sauce bottles! I like how they are clear and work well with any sauce. The top portion is the most important as it has a lip around the bottle where it touches the lid and this part prevents leaking from happening. Best value you can get! Bigger than I thought they would be, not that that is bad, just unexpected. They seem well made and sturdy and given the larger size will require less refilling - can't wait to start using these for my ice cream sauces! These are very durable squeeze bottles. I am using mine to hold sauces and fine purees for my milkshakes for my bakeshop. Exactly the size I need and only refill once a day. With this one no more spils or bottle opens!! works great the perfect size to put it on a table, any kind of dressings, ketchup or mustard!! We use these squeeze bottles to fill different kinds of sauces for the prep table. It’s clear material makes it easy for cooks to easily see what’s inside and how much is left. These squeeze bottles are a high qualit, we bought ours more then 2 years ago and they are still in service today they are a very strong product for the amount of usage we put them through! These 16oz bottles are a great addition to our kitchen. This size is great because it holds just enough liquid. We use ours for canola oil for sautéing and the like. Very well made, thick plastic that also insulates well. Cap screws on tightly and I haven't had a single bottle leak or lid pop off on me yet. Highly recommend. These squeeze bottles are great. We use them everyday in our kitchen. The wide mouth makes it easy to load, and they hold enough that we don’t have to refill halfway through service. These bottles are great. We use them for our homemade bbq sauces. These fit well in our table caddies for our customers to use. They are easy to wipe down for a quick exterior cleaning. Great squeeze bottles. Great price and quality. Withstands high temps and easy to clean after use. The six pack is perfect for us. Always have a few on hand. These 16 ounce clear wide mouth squeeze bottles are perfect in our restaurant business. The lids seal well and there isn't any mess like lesser quality bottles. I would highly recommend these. These squeeze bottles are good. The 16 ounce size is good for slower volume restaurants. The white plastic top is unable to stand any significant abuse. Many if not all of ours broke within a short amount of time. Still gets the job done though. Nice size and quality squeeze bottles. I use these for water and oil at the flat top. For adding steam or for a dose of oil before starting for the day. I've also used these for sauces when doing buffet style food. While it might not look as fancy as a bowl of sauce and a spoon, it is a lot cleaner and easier for people to use. These are really good sized bottles. The clear style is perfect for oils and homemade sauces. We use them to dispense olive oil and it is very easy to evenly coat a pan. Love these, i purchased them to make a variety of sauces for a Mexican Feast i had. Next time i will get a smaller size these are way to big for what i needed. I had 6 different sauces, i didn't need so much of each sauce. Would be great for a different setting so i am satisfied with them. Squeeze bottles definitely get abused in the kitchen and these bottles are holding up well to that abuse. I like the 16 oz size it works well for our items that we don't need a lot of like mayo and the wide mouth bottle makes it easy to fill. Great product , we love these squeeze bottles we use them for almost everything , from mayo to dressings , they are easy to use and clean and the price is unbeatable . These are all we use. Keeps our sauces and ketchup fresh. The top is great because you can easily make the opening to fit whatever need you have. We put our salsa in them and all ingredients including the onions flow perfectly. These squeeze bottles do a great job at our establishment of keeping all our dressings organized and usable. They are easy to clean and replace. Great for sauces and to keep oil nearby while cooking. The plastic is thick, not cloudy and has no noticeable odor. They wash up great in the dishwasher. Solid bottles. We use these squeeze bottles in the kitchen for finishing with our flavored oils. So far no drips and the lids seal it nice and secure. We just cut the tips wider for the ones that have pesto. Works like a charm! This is great product for serving barbeque sauces for a large group of people. It cuts down on the amount of wasted product, as opposed to using bottles. I absolutely LOVE these things! I use them for oil for the flat top, and I use them for things like mayo and mustard for making sandwiches. The wide mouth makes filling them a breeze--I totally recommend them to anyone--pro or home chef! We use these clear wide mouth 16 oz bottles for a variety of things. Work great for thick sauces and even mayo. Easy to clean. Great value squeeze bottle here. Great for dispensing dressing, sauces or any other liquid. Screw on cap has a fine tip that works great. Very pleased! These are the better quality bottles on the market. The wide mouth makes it very easy to fill without making a mess. These are the only bottles I buy now. These 16oz Clear Wide Mouth Squeeze Bottle - 6/Pack work great. They do the job for what we need them for. I will order again. This 16 ounce squeeze bottle with cone tip is a great product. Simply fill with your favorite sauce or dressing, screw on the cap, and you're ready to start dispensing. Great value product! We use these for oil bottles when oiling dough trays. They are a great price and with the wide mouth they are very easy to fill. A perfect sized squeeze bottle essential to every professional kitchens inventory. These are very durable, and easy to clean bottles that come in a variety of sizes. Not bad. I will the say the lids are quite brittle. If they are dropped they easily break into pieces. Didn't have that problem with other bottles I have purchased. These squeeze bottles are perfect for dressings, oils, and anything else you can imagine. I like that there is a wide opening in the bottle but the nozzle opening is a little narrow. I love the wide mouth so I can clean them easily, and the tops are great for sauces with big chunks in them since I can cut off the tops to make it the right size. These are great condiment squeeze bottles. They are the perfect size for a small gathering and are easily washed. They dispense just the right amount too. I Wanted to give them five stars but the tops will pop off completely if the product inside is too heavy. Our house tartar and parm garlic will cause the top to pop off if it is turned upside and the bottle is full. But other than that it does fine. These squeezes rock. We use them at our coffee and tea shop for chocolate, ketchup, mustard and other sauces. No leakage issues at all which is great! Great squeeze bottle, we use them for all of our sauce and dressings. The fine point works great for detail and finishing work, wide mouth is great for filling them, we continue to buy again and again. This is a perfect squeeze bottle for snow cone syrups. You just put them at the table and refill them if they run out. I had ) syrups so this was perfect for me. These are my favorite squeeze bottles ever! Their material is easy to wash. It's durable. These are top quality ???? Let's not mention the super low price for a 6 pack! GO WEBSTAURANT STORE. I use 3 bottles first for my syrups. Good size to grip. I just cut top of it, want to squeeze more quick and easy. Love these bottles! We use these for many different products. Sauce, dressing, and more. Durable and long lasting. A product we will definitely stick with. Picked up a set of these for all the toppings on the cart. Looks sharp having matching bottle sizes and allows for a cleaner look and more organized htodog cart. Easy to clean with wide lids. Love these! These worked out perfect for our Ketchup, Mayo & Mustard at our cookout instead of using just the regular condiment bottles. These squeeze bottles are so clean looking and a perfect size. Very good quality squeeze bottles. Easy to squeeze, not too rigid, not to flimsy. The top screws on very securely. For the price, can't really complain. Maybe if would be nice if they came with a cap. All catering companies must have squeeze bottles. The wide mouth bottle makes it much easier to pour dressings and sauces inside without spilling. The pack comes with 6 bottles. We can not find these anywhere at a better price. Buy a few packs! You will not regret it. These are obviously great for sauces, dressings, and other condiments, but I've found them most useful for dispensing snow cone syrups. Not to mention you can make really fun pancakes with intricate designs if you "draw" with them. Love these! These wide mouth squeeze bottles are perfect for squeezable toppings like Nutella, peanut butter, butterscotch, etc. Our customers love the ease of use of these bottles. We purchased this product for our restaurant and are very pleased. Nothing fancy but it does the job quite nicely and was a great value. I highly recommend purchasing! This is an awesome bottle to have in the fridge to organize your condiments - for someone like me who likes organization and uniformity, nothing brings me more pleasure than seeing everything nice and neat on the fridge shelf! Good squeeze bottles. They hold a full pints with of product and are durable.They take a little bit of a beating, and the tops haven't broken. Good recommend. These are the best plastic squeeze bottles we have purchased. They are much better quality than others we've bought from grocery stores. The tip opening is also large enough where we don't have to snip them for most of our sauces. Great squeeze bottles for a very affordable price! We use these for catering events for drizzling sauce, and they work really nicely. They hold 16oz of liquid or sauce, so you'll have enough to last for the whole event, or, just utilize as many bottles as you need to accommodate. They can be refrigerated just fine as well. super easy to use squeeze bottle, solid plastic and clear. Multiple options on sizes that fit into each other for simple use and storage. Would recommend purchasing. If you can beat this price, go for it. Webstaurant has this item for a steal! We use these for our AMAZING BBQ sauces. Load up on the six packs so you can put 4 different sauces on every table - from mild to "uh-oh!" These bottles are great. Who would have thought that something so simple could make your kitchen so much more efficient. I have these filled with different oils that I use regularly and find it so much easier to add a little as I'm cooking. I highly recommend these if you use many liquid components while your cooking. I purchased these 16 oz clear plastic bottles to put syrup in at the tables in my restaurant. So far so good. They get washed very frequently and haven't shown any wear and tear. High Quality 16 Ounce Clear Squeeze Bottles are a must for anyone in the food service / beverage industry. These bottles seem to last quite a while and are very easy to clean. We use these as our normal condiment dispensers. We use them everyday for ketchup and mustard on our tables. We also love to use them for salad dressings. Another use that is handy is for application of icings on scones or muffins. These bottles are perfect for multiple uses. We use them for all of our salad dressings, liquid butter for the flat grill, chocolate syrup for turtle cheesecakes, to refill salt and pepper shakers...... the uses are endless!! Great Quality Item I have used these to for Soy Sauce, Ketchup, Mustard, Ranch dressing and pretty much every type of dressing. I would recommend these squeeze bottles to anyone. Easy to use! You can never have too many of these bottles and lids. They are at such a great price at webstaurant.com that you might as well buy 2 packs! We use this to serve thousand island and its an excellent item to be able to keep sauces organized. You can chop bits of the top off with scissors to be able to serve multiple, more thick sauces. Very good product. We use it for Olive oil and Vinegar. No spills at all with it so far. Very comfortable to sue when plating salads. Excellent little squeeze bottle. I was expecting it to flow faster, but love the control we have over the flow. It nearly doesn't flow until squeezed. We think this is perfect. These 16oz bottles are perfect for pancake art. If you have never tried pancake art you need to look it up on the internet and see what it is. customers love the art. This product is great for the Salad dressings and condiment products. I originally bought 2 and reordered more. Highly recommend for any establishment. Great quality. This bottle is large for those marinade BBQ sauces. Now you can use it during cooking or during your meal as a dip. It's great to have on hand when you want it. They come in a pack of 6 so you can give a couple away to Fiends or family. These are pretty durable as long as you keep them away from heat. Function well and are very useful in our kitchen. Price is certainly right. These squeeze bottles have help up to repeated filling and washing. The wide mouth makes them easy to fill as well as clean, and they do not absorb smells or colors from the food inside. Really like the size. Don't have to refill all the time during service. Super durable, and I can squeeze the heck out of them and the lid has never burst off like some other squeeze bottle tops do. The size of the bottle is perfect, large enough so I don't have to refill too frequently but small enough the sauces don't go stale. I am so happy with this product! The price was amazing, the shipping was secure and fast! The quality of this product will last me years with no problems! Will definitely be purchasing more in the future! We use these bottles for our homemade dressing as well as our chocolate sauces and melted butter. We a,ways li,e to keep plenty of these on hand. Ordered these for coffee syrups, we had the slimmer ones but these are bigger and better. Sturdy plastic for easy clean up. Would definitely recommend. These bottles are great for storing oil when using the grill. They are also good for condiments like ketchup and mustard. Salad dressing for the sub station and we did not pay much for this item. Multiple used for one bottle. Always a stand-by in any kitchen. Great for dressing or what we have been using them for, pancake art! Someone is always getting creative and trying to draw something for breakfast. Great multi use tool for any kitchen. A way better price than I've found on any other site, or in restaurant supply stores. They last quite a while as well. We bought 3 packs of these. So far we have not had any issues with the bottles. The caps are very easy to put on as well and they do not leak. These squeeze bottle's are great for sauces that you use in smaller quantities. Easy to clean and assemble. We have a whole line full of these with our different sauces. We are famous for our ranch dressing, and we have to have MANY bottles filled and ready for action. These squeeze bottles have worked out perfectly. Just clear enough to see how much ranch is actually in the bottle. I purchased these to use for mixing colors with soap prior to filling my molds for creating swirls and designs in the soap. Large top makes them easy to clean. Great buy and price. As with most products from the Webstaurantstore, you can't beat the the price. Quality is great as well. We use them for all condiments and even oil. Nice tight seal and long lasting. No complaints here. These 16 oz. wide mouth squeeze bottles are great. As opposed to smaller versions, these bottles are easy to clean. Use them for all sauces and clarified butter. These squeeze bottles are excellent. We put our caramel and chocolate sauces in them. They are high quality and you can't beat the price. We were using some we found at sams club but they started to leak. So far these haven't leaked a drop. I don't even know where to start with these. The price is A+. The amount of uses these little bottle are good for is indefinite. We use them for carmel sauce, dressings, chocolate syup and much more. We use the clear squeeze bottles for sauces and toppings. The clear work well because we can see exactly what's in them. Price is great too. These come in handy way more often than you'd expect. I love using these to make pancakes and do awesome designs while icing cookies. They are easy to squeeze and work well in the dish washer. I love these. We use them for everything. They hold up well, even in a dishwasher. I do wish however that they sold replacement lids since they are always misplaced. The 16 oz wide mouth squeeze bottles are great for a little bit of everything. We've been using them for condiments like ketchup, mustard etc but have just recently started using them at our dessert bar and have had no issues thus far. Very easy to clean and extremely affordable. I ordered a package of these to test, and I've now switched all my bottles over to these. They're sturdy, I love the wide opening for filling, and they don't leak or have the lid pop off like some other brands. Great cheap squeeze bottles. I only needed a couple to hold oil water and liquid margarine in for the flat top but the price was so cheap from webstaurant that I got the 6 pack. 16 oz bottle is a good size for our dressings. Flexible enough to squeeze but strong enough to not break when the product is cold inside. I am in receipt of a 6 pack of 16 oz. Clear Wide Mouth Squeeze Bottles. I like the larger size, and use them in the kitchen, but they are equally valuable to our customers who can serve themselves a myriad of condiments from them. They are clear, so the contents can easily be seen, have large mouths for fast and easy refilling, and easy cleaning as well. A must have item. Our bar has a bunch of these. We mainly use them for olive juice, but pretty much any mixer we have has been in one of these at some point. We love these. We use these for all of our thinner liquids ie: cream, maple, hot sauce etc. Holds a good amount and easy to fit in our small fridge. Tips on the lids are easily cut for larger openings. This squeeze bottle holds 16 oz of liquid and has a top that is the same width of the bottle. It is great for oils. These bottles are of great quality! I wanted to make sour cream squeezable and these were the perfect solution to that! I whipped up the sour cream with a bit of water and put it into these bottles and it makes serving the sour cream so easy! It was nice that they came in a 6 pack because then I have extra filled bottles waiting in the fridge! It makes it extremely convenient to just take pull out the next one when the first is empty! The top stays on tight and doesn't come off when squeezed and doesn't get clogged! I could see these being used for several things!! These bottles were a great buy for us. We use these bottles for our syrups and sauces. It would've been nice if these bottles came with a lid of some sort. This Clear Wide Mouth Squeeze Bottle is a perfect solution for any use. You can also write in the bottle, the bottle is clear and the queeze is without cone. Wonderful bottles, that can be used for a multiple of things. I love the wide mouth for refilling and makes cleaning much easier. Thank you! We have lots of sauces in these bottles. Very versatile in the kitchen. The wide mouth makes filling them easy. Good quality for the low price. I purchased the Wide Mouth Squeeze Bottles to use at my children's birthday party. They were placed at the food table, having been filled with various condiments. The wide mouth made it very easy to fill the bottles. We also labeled them. They worked well, the tips didn't clog, and they were easy to clean. This is great for condiments like salsas and I also use it for other things like oil. Point is small for the salsas , but I chopped it off. Now it works great. We use these bottles to sample salsa at various events and they are the perfect solution to control portions and keep our sampling table clean and neat. We apply a product label for easy identification and branding. Nothing much to say here. Good bottles at a fair price. The tops can be cut easily depending on what you are dispensing from them. What really can you say about squeeze bottles? These are easy to fill, easy to clean, dispense as expected. And the price here is unbelievably good! We use them for a number of things and will always have them around! We're using these to quickly dispense our handmade syrups into drinks rather than our previous method with a flip top glass bottle which would get syrup all over and was just a mess to use. These are a breeze to clean up as well. For the price these bottles cannot be beat. I had to buy more recently because the lids were cracking at the bottom of the spout. However I feel it is from the employees way of transferring over to other bottles trying to get the last bit out. They will bang them against the table and transfer the rest over. They do stain but what can you do with mustard and ketchup? The size of this bottle is great, but we had issues with the lid. When you squeeze too hard on the bottle, sauce leaks out the sides of the screw top. Messy. I have a few of these and use them for our sauces and dressings. So far they have held up well and the top still tightens like it should. These bottles are a great find. The wide mouth makes it easier to clean out after you're done with them. And the plastic is soft but not too soft that it will crack. I use these for BBQ sauces and one sauce I didn't strain out the onions so they clogged the nozzle. But that's not a problem because you can always trim the nozzle further down to make a wider opening if you need to. But the nozzle untouched dispenses a thin line of sauce that makes it easy to get put down just the right amount. The clear plastic will stain a bit depending on what you put in them but not really a big deal for home use. I didn't think I would use all 6 so I kept 2 from the pack and gave the others away to family. I'm starting to regret that - I could always use more. Very happy with these large 16 oz clear wide mouth bottles. Easy to fill and great for salad dressings. The price was good for a 6 pack. Glad these come in a 6 pack because they are handy for many things. Used already for mayo and oil but will also use one for dish soap, why not! The nozzle, if you do not squeeze, will only gently drip a few drops of liquid at a time if you wish .. so it is easy to control how little or lot comes out at once, especially with lemon juice which is yet another we did. So yes great squeeze bottles! What a fantastic find. I purchased these and glad I ordered two sets. My husband is a retired chef and uses these to put in his special salad dressings, each are labeled for people to choose from.. They are better as you make your own dressings without added items as you get in the grocery store dressings. He also makes his own sauces and uses them in each bottle . Saves you so much time when you use these squeeze bottles. I also use them in the shower for shampoo, rinses, body washes.Much easier for people to use in there. Many other uses you can come up with. Love these. PErfect all around squeeze bottles for our bbq sauces. plastic seems a little thin and might get foggy over time but good price. We lose these things all the time. My dishers might throw them rather than have to clean it out, my cooks will leave them under heatlamps on the line or set them on the grill. Good thing I have a cheap source for these! 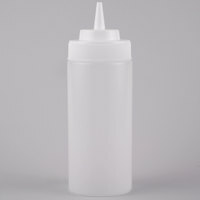 Great large size bottle - so handy to have a bunch of these around for sauces, condiments, royal icing etc. The wide mouth makes it so easy to clean. Very sturdy, don't split, well threaded cover, and the wide-mouth opening makes refilling super easy and mess free. We use these for a variety of sauces, barbeque, ranch, hot sauce, etc. and they are fantastic. Talk about your must have bottle ... we have a dozen of these and they are our go to bottles for our sandwich spreads, oils, and many other things. Easy to fill! These bottles are great. They don't leak and with the wide opening they make it easy got me to fill them. The only down side, that I found, is that they don't come with caps to keep them sealed. I was able to locate "dust caps" on the Internet. Now these bottles are perfect! I love these clear wide mouth squeeze bottles! I use them to hold oil, vinegar and salad dressings! They're great and have had good luck with them! Would buy again! Can I give these 10 stars?? Had to toss my other squeeze bottles because they were such a pain to clean. The wide mouths on these are FABULOUS and the nozzle tips are the perfect size. The tops are easy to screw on and off and do not over rotate or leak. Great bottles, great price. Always in need of more bottles for some reason but at this price, who wouldn't stock up on them. Convenient 6 pack of bottles and lids. We use these 16 oz. squeeze bottles for back of house prep. Their large capacity are perfect for our needs and the price is amazing, too. These are nice and big and great quality. My only complaint is that they don't come with the little caps so you can't close them. This really gives you a bang for your buck if you buy in bulk. This product is great because we also buy sauces in bulk so we fill the bottles from our jugs and they also save fridge space! These bottles were a great value. They also seem to hold up well over time. We have used them three times already, washed them in the dishwasher and they show no real signs of wear. Great product! I use these for anything from sauces to pastry cream. These squeeze bottles provide great control so that one can make sure that products land where you want them. The plastic is heavy duty but flexible enough for effective squeezing. Very happy with this product. I use them for different thing, first for my crepes, one for the nutella crepes one for the lemon sugar crepes, one for peanut and jelly crepes and for the rest for different liquids. We use these 16 oz bottles for sauces and dressings, they work well. Easy to clean. Nothing wrong with them. Great value on any size here, we love this place! This is the best value you will get for a simple squeeze bottle. The price makes it easy to keep as many bottles as needed with dressing for the day and allows you to rotate bottles instead of just refilling. Also, the tip is small in case you have dressings that are thin, but you can always cut the top lower for a wider tip. Highly recommended. These are on of the most essential tools for any kitchen out there. I have searched the web for the best price out there and this is the best price. We purchased both the 16 oz and 32 oz squeeze bottles. We use them for various sauces and dressings, they are easy to clean and withstand commercial dishwasher well. I like the wide mouth squeeze bottles, easier to fill and wash. Also the 16oz is a great to have around. Webstaurant has the best prices around! Well made and easy to fill up with the wide mouth. We use them for a number of things. Most of our uses require us to cut the tip off to get more product out but it cuts easily. Can't beat the price! Solid handy tools for making cooking/plating items much easier and faster. We use these for salad dressings, hot sauces and much more. Will get stained but its not a big deal. Use these for sour cream, considering that when the sour cream gets low we bang the tops, they've held up very well. Our of all the ones we have, only a couple over the course of a year have cracked from slamming the tops. Comes with 6 16 ounce squeeze bottles - perfect for ketchup, mustard, salsas, vinegar, & water. The top is also a really tight fit so will leak out from the sides. perfect size to have in prep table. We have them for different sauces, easy to fill, and easy to wash. the do not stain from different color sauces. Compared to normal squeeze bottles, this is worth the price, if only because it is much easier to clean. Can easily fit cleaning brushes/sponges into this one. Plastic cap and body are high quality. These squeeze bottles are a life saver. They are great for making and serving your own salad dressings/sauces/toppings. I have also found that they are very easy to clean and can be used multiple times. I do wish that they came with a cap for the end of the bottle. I have been using a piece of tape on the end. I have purchased several of the wide mouth squeeze bottles for use in my home kitchen. I use them for dispensing and storing my homemade salad dressings as well as homemade chocolate and caramel sauce. I also use one to keep olive oil in for quickly adding oil to saute vegetables or to brown meats. I have even put pancake batter in them to create fun pancakes for the kids for breakfast. I cut the tips down to make a wider opening for thicker items. They are great! These are exactly what I was looking for. Wide mouth makes them easy to fill and they are nice and sturdy. Great for catering when you want to serve mustard or sauces and also great for sandwich prep so you don't have to keep digging into a jar for mayo. Love them, will order more for sure! We are using these for toppings such as sprinkles, and any other small particles, to reduce mess. The opening was not very large, but we cut off the tip and then drilled the hole a little bit larger - perfect! Believe it or not I use these bottles for liquid body washes. The body wash container is just too big for my granddaughter's hands. I simply squeeze the body wash into these bottles and she's happy. I've also used these bottles for condiments. The wide mouth is a big plus. I buy all types of squeeze bottles on a regular basis from Webstaurant to use in my ice cream business. Good quality and competitive price! We buy these all the time and are never disappointed with the performance of them. They are very useful and helpful around the kitchen. Always keep extra around. Just as good as any other squeeze bottle until you drop it. If its full and falls off a counter or table the top will crack leaving it unusable. We use these for our veggie bar at our our sub shop. They are great for all our sauces and dressings. We also use them for carryout orders. We use these for all of our syrups, like Caramel and Chocolate, and they work great. Not too much comes out if you squeeze to hard, and even the thicker syrups have no problem coming out. Great squeeze bottles for just about anything. We use them for oils and dressings as well as all our other sauces. Makes elegant plating extremely easy. These are really good for keeping oil in beside my griddle. I think it's a neccesity. Great price on this site too, much lower than anywhere else. these squeeze bottles are a great add on to any kitchen. can be used for hot or cold, with this you can control cost all the way around. great product. These squeeze bottles are perfect for dressings, oil and vinegar and specialty mayo for sandwiches. They are very inexpensive so they aren't hard to replace and they work just fine. Multi use, wide mouth squeeze bottles. We use these at the bar and in the kitchen. Anything from bloody mary mix/spices to specialty sauce preparation. Good value. these are great to have in every restaurant. they work nicely for everything from garnishing plates to keeping ketchup and mustard. another essential to every professional kitchen. Great for mayonnaise and making those delicious sub's, Fill up the 16 oz. Clear Wide Mouth Squeeze Bottle with your favorite dressing as well nice and soft bottle. these 16 oz. Clear Wide Mouth Squeeze Bottle are really great i used the everything from ketchup to my sauces the best bottles i have found. The 16 oz clear wide mouth Squeeze bottle comes 6 in a pack. These containers will come in handy for storing cooking oil, sauces, honey and more. These work great for our sandwhich prep cooler and for any kind of salad dressing or sauce. The price is very good for the quality. These bottles are great. Originally we got them for sauces, but they have served another purpose for oils, juices, etc. So they are very helpful know. Great buy! these are great all purpose squeeze bottles. they are better quality than most others available. for a great product at a great price you can't go wrong with this one. Great squeeze bottles for hot or cold sauces!!! Great value pack/ price!! Wide mouth top makes filling the bottles a breeze, you just have to turn them over and pour your dressing, etc. right in them! Good size for salad dressings! Perfect size and the lids stay on. Have tried others squeeze bottles and the lids would pop off, not with these, the lids stay in place. And they clean up great in the dishwasher. Our chef loves them. Good product, great price! I use them at home for storing mayo, catsup and mustard. I do agree with another reviewer that the only reason I did not give them 5 stars was because they do not come with caps. The bottle is great for sauce, hot sauce, mustard. It is very sturdy and not to mention the price is unbelievable. I definitely will buy more.